Ah, the pleasures of canoeing on the majestic Charles River. The splash of the paddle in the water, the geese flapping through the air, the turtles and fish finning their way through the water, the alligator sunning itself on a log. Whoa, hold on there. An alligator? Yes, an alligator. An alligator spotted Thursday by a canoeist paddling on the Charles River south of Boston was captured this morning, state officials said. The reptile was captured at about 6:30 a.m. by a specialist from Rainforest Reptile Shows in Beverly, said Wendy Fox, a spokeswoman for the Department of Conservation and Recreation. Topher Cox, 38, of Needham, an advertising photographer, said this morning that he had bought a canoe on craigslist.org and was taking it out for a spin Thursday afternoon when he saw the alligator, which he estimated was about four feet long, on the river off of Needham Street in Dedham near the Needham line. Cox took a picture with his cellphone, then maneuvered closer. "I thought it was fake at first. ... But I bumped the log and, sure enough, it jumped on into the water," said Cox. Cox admitted he was a little bit afraid. "Of course," he said. "There's an alligator in the water, albeit not huge." Cox called 911 on his cellphone and once people figured out that he was serious, the Dedham police dispatched officers, and the Needham animal control officer also responded. An expert from Rainforest Reptile searched Thursday afternoon, then returned to the spot this morning, eventually grabbing the animal with his bare hands, Cox said. The animal slipped away, but Ralbovsky knew it would return, seeking warm sun this morning, so he was out on the water at daybreak, he said. "He set up house right in that area. I knew we were going to be able to find him," he said. Ralbovsky said he reached into the water and grabbed the alligator by the neck. The animal didn't fight much because it was cold. Ralbovsky said somebody who owned the alligator had turned it loose illegally. The animal was healthy and will now be used in Rainforest Reptile shows until it gets too large -- it's expected to grow to 12 feet long -- when it will be transferred to an alligator farm in Texas or Florida, he said. For Cox, who will be shooting a bank ad in Maine next week, it was a unique experience. "I certainly wasn't expecting to see an alligator that day and I don't know that I'll ever be paddling down the Charles and see one again," said Cox. "So I feel pretty honored to have seen this animal close up." 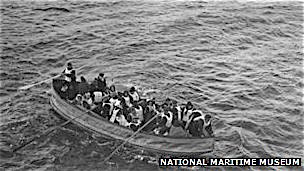 "A coda to the rescue of the lifeboats came on May 15, 1912, exactly one month after the sinking, according to “Titanic Tragedy.” The Oceanic, steaming west, encountered one of the Titanic’s collapsible lifeboats, riding low in the water with three bodies in it. One was a passenger wearing black tie and a fur-collared overcoat; the others were a coal stoker and a seaman. After Oceanic crew members brought shrouds and a Bible for burying the dead at sea, the boat was hauled aboard and it, too, was taken to New York." Pollock mentions that when the rescue ship Carpathia arrived in New York City where friends and relatives of the survivors were anxiously waiting for them, the Carpathia went first to the pier of the White Star, owners of the Titanic, and dropper its lifeboats there before proceeding back south to Pier 54 to let the survivors reunite with their loved ones. 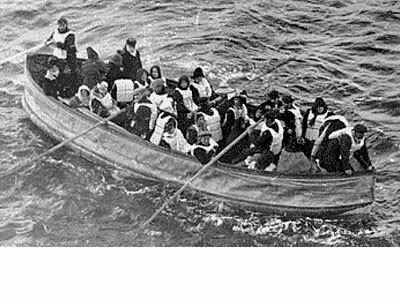 The Titanic's boats were used on other White Star liners as it was obvious no other ships could ever again operate without lifeboats for every person on board. That alligator would have freaked me out too! Good thing he had taken a photo of it or no one would have believed him. 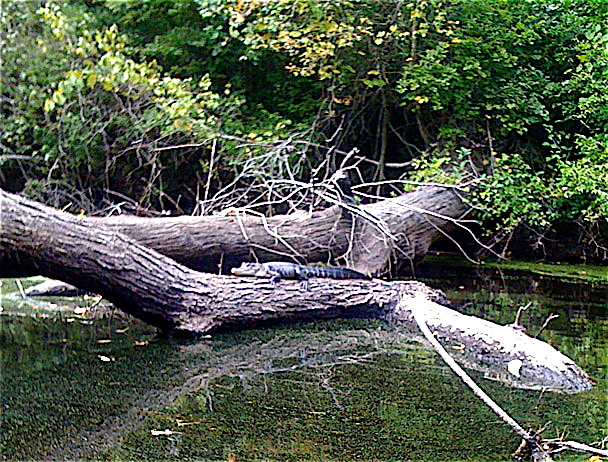 Alligators in the St. Charles river is an unsettling thought indeed. I am so glad I wasn't on the river at the time. I'd never get in a canoe again! I grew up with alligators in the rivers as a kid, so I guess they don't faze me any longer. Odd how that works.